Sir David Higgins has quite a CV: he ran one of the world’s biggest property companies (lend Lease), masterminded two Olympic Games (Sydney 2000, London 2012), and successfully managed Network Rail. He’s now capped all that by taking over High Speed Two, seen by many as a poisoned chalice. Not a chance: 15 days into the job, last Monday, he turned the project upside down and inside out. Upside down, because he wants to get the new line as far north as possible as soon as possible: specifically, to Crewe, which he sees as a major gateway to North West England. Inside out, because he stressed the point that critics of HS2 have repeatedly made: that to work, it needs to connect to regional rail networks to lagging northern towns. He emphasised “the poor connectivity in the North, not just between the region and London, but also east-west between Liverpool and Manchester, Manchester and Leeds, Leeds and Hull. Those challenges have direct consequences, not just for the economy as a whole, but for people’s daily experience and aspirations”. This was a massive boost to a dedicated group who have been campaigning for a major upgrade of that TransPennine rail link: they argue that electrification, to be completed from Liverpool to Manchester this December and to Leeds and York by 2018, should be complemented by curve-hugging Pendolino trains when the franchise is renewed in 2016. But there’s one further wrinkle: the first 15 miles out of Liverpool, choked by Merseyrail stopping services. Their radical solution is a new high-speed rail bypass, shared with a branch bringing HS2 directly into Liverpool, either to an extended Lime Street station or via a long-disused tunnel into a new underground station close by. You’ll be hearing plenty about their campaign, hopefully soon with backing from Liverpool’s civic leadership. 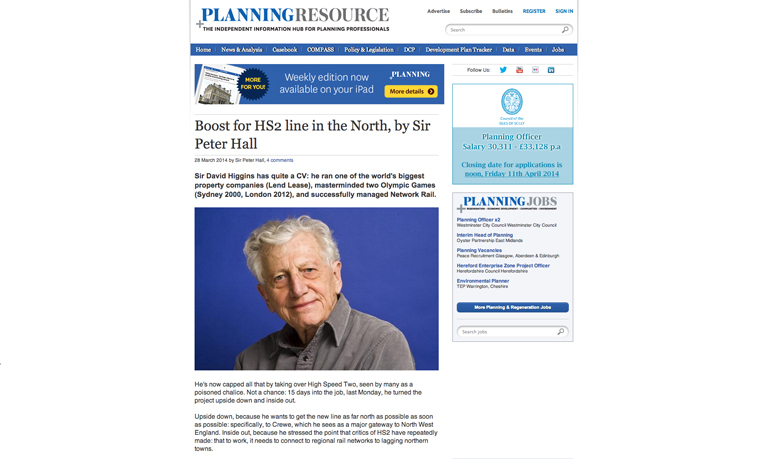 But the Higgins announcement brought less welcome news for northern cities: the cancellation of the mega-expensive, bitterly-controversial link from HS2 to HS1 in north London. Transport Secretary Patrick McLoughlin’s announcement said he’ll look at alternatives. So here’s one (no consultancy fee): a 500-metre link at Queen’s Park through a builder’s yard onto the existing Euston tracks, plus 200 metres of viaduct at Camden Road to separate the Overground tracks. Sorted!